A new study looks at the ideal locations to be self-employed -- and Silicon Valley isn't one of them. Launching a business is never easy. From startup costs, hiring the right team to growing a customer base, at every stage of the game, you’ll be met with new challenges. What you you may not realize is that your homebase is a factor that could contribute significantly to your startup’s chances of success. There are some places in the country that are more hospitable to new business owners than others. To that end, personal finance platform SmartAsset conducted a study to find out which cities are the best places for aspiring entrepreneurs to become their own bosses. It assembled data based on six factors: the percent of self-employed workers in the city, their average income, median housing costs, median housing costs as a percent of self-employed income, the city’s tax environment and its unemployment rate. The states that are most represented in the top 10 are Texas, Louisiana, Kansas, Arkansas, Kentucky, Utah and Tennessee. 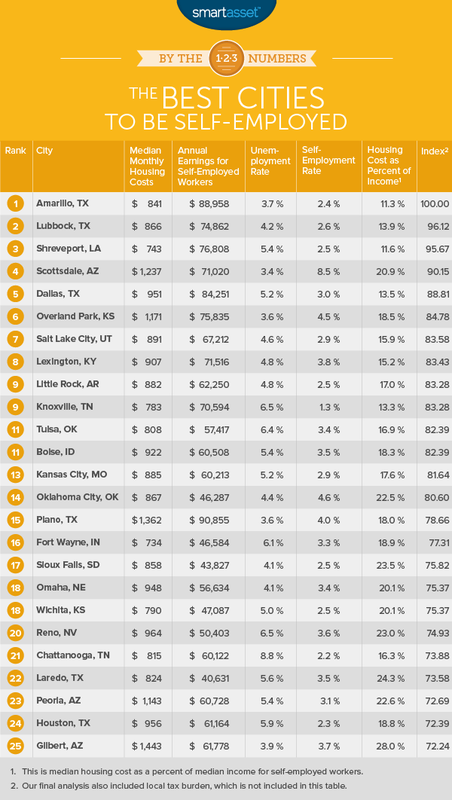 Amarillo, Texas, is the top city, Lubbock, Texas, is number two and Dallas is fifth on the list. When setting yourself up to be your own boss, you’re likely to be working out of your home. Since it can be somewhat isolating and demanding, especially in the beginning, think about where you can set up shop that will not be a drain on your resources or quality of life. 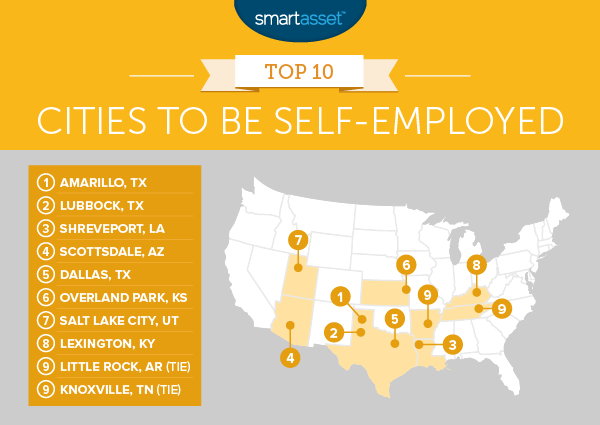 Check out the infographic below to learn more about the best cities to be self-employed.